Would a Hurricane Barrier work for Highlands? Anybody ever been to New Bedford, MA? This is where the dedication to the largest Hurricane Barrier in the world took place in 1966. Back then, it cost $1,000 a foot, is long enough to span the 3.5 mile width of New Bedford, is as high (and wider ) than The Great Wall of China, and has enough steel in it to build a Navy destroyer. Its two huge steel navigational-sector gates weigh 400 tons apiece-each 35 tons heavier than the biggest train ever built-and each as tall as a six-story house. It was built to with stand a Cat 3 hurricane. That being said, the barrier does close up to a dozen times a year for storm events that bring southerly gales and tidal surges. The biggest test to date was Hurricane Bob in 1991 where it protected the village from just under 8 ft tidal surges and saved the town 10’s of millions of dollars. But, if we could get past the red tape, and did some sort of rock structure that spanned from Highlands to Sandy Hook, it could potentially work and not only protect us, but also some of the upstream towns like Sea Bright (as their flooding is more river side than Ocean) and Rumson as well. 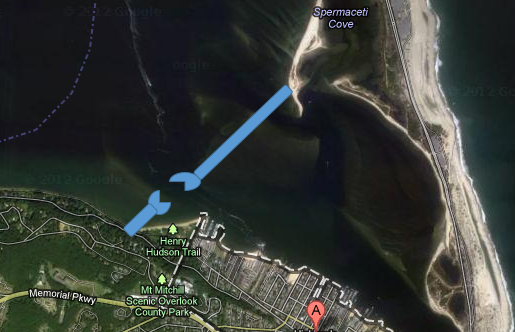 Imagine this.. We start the structure from the Henry Hudson Trail & from Spermaceti Cove on the Sandy Hook side. This would take coordination between State, Federal and local officials. In New Bedford, fishing or just plain strolling along the barrier is welcome. Today, by agreement with New Bedford city, waterfront, and industry officials, the Engineers shut the gates when tides rise 4 feet above mean high water level. Can you visualize never having to move your car again? So the benefits are: Protects more towns than just Highlands. Can be an extension of Pompora & Sandy Hook parks. Could be a tourist attraction, see twin lights, sandy hook light house and biggest hurricane barrier in the world. WOW – that is really cool, probably too cool for Highlands. Does the Army Corps of Engineers take suggestions? Pretty cool, but an EPA circus. Forget about fixing the bike trail which is basically at water level. The shore water will probably rise with or without the gates open just from how quickly the tides come in and recede in the bay/river. Imagine if there was a huge wall during Sandy blocking the river, the AH harbor would have been under twenty feet of water. It looks like the MA barrier extends the length of the nearby shore line to protect flooding in other areas. I am not an advocate of being penny wise, pound foolish, but spending hundreds of millions on a barrier when half the town floods at moon tide seems foolish. Start with the drainage. I tell what you what though, I would love to take a nice stroll across the bay to Sandy Hook on that thing! I remember reading this: http://www.pbs.org/newshour/rundown/2012/11/engineers-draw-barriers-to-protect-new-york-from-another-sandy.html. Most of them focus on barriers closer to NYC (hey, let the water hit NJ! ), but the last one is pretty interesting — build the wall across from Sandy Hook to Rockaway, with a few gates. I think the problem with any of these is that the people on the other side of it are going to get screwed, somehow. The water has to go somewhere, right? That and getting the EPA, the Feds, the States, and who knows how many other bits of bureaucracy involved. I do like this plan as an option though. Extra park space and bike paths are always good to me. Yes, we are currently conducting a feasibility study for Highlands, NJ. It is expected that we will receive funds from the Sandy Supplemental to complete this study. After Sandy we were able to obtain the necessary rights of entries from the Borough and private residents so that we were recently able to complete the geotechnical borings needed to move forward with the study. We are currently evaluating the economics and post Sandy conditions. By the way i always signed the right to acess it was only boring samples and non binding.It didnt commit anybody to anything but by not doing until after sandy a simple thing that could have been done 10 years ago has put highlands behind once again. I totally agree with you Johnny u but aren’t you the same person whose insurance paid for your permits so had no empathy for most people whose did not? I submitted letter from my insurance company stating it wasn’t covered and still they insisted they did. Thats all that needed to be done to refund. Have residents only come to office with letter from insurance company stating their insurance company does not pay and refund. Would of been the decent thing to do. When election time comes I hope everyone on this blog does not forget this. Too help pay for this the state EPA could look at building a mooring field to anchor both transits and seasonal boats. Highlands could and should be the the next Newport. if sir Lipton was still here I think he would agree. The Outer Harbor Gateway seems the most feesible for another event like Sandy. It would help the most people by far even though it would be the single most costly. The issues I see are siltation, worse flooding in the Rockaways due to the piling effect of water on the ocean side of the barrier, then the water in Sandy came over the Hook. Does that mean the Hook is going to need to be built up higher? Then you also have the issue of water piliing in from the backside from The Hudson, the Raritan and the combination of the Navesink and Shrewsbury rivers not including who knows how many Tidal creeks. Remember the Shrewsbury has the third fastest tidal current in the world not to mention the sheer volume of water coming from the Hudson.Then you also have to think of maintenance. Is this federal or both states and how do you think those that don’t live in the flood zones are going to react to the increase in taxes to cover the building and maintenace of such an undertaking when it doesn’t directly affect their lives? This is a much bigger issue than a lot are thinking about in the previous posts. It also still doesn’t address the flash flood issue and tidal flooding that is the primary issue in town. I don’t claim to have the answer but I think we have to address the more common flooding and less costly issues first. The surge comes in from up the Atlantic Ocean and the project does actually include the Ocean side being built up. This is to address long term rising seas for future large events but we need multi-approach such as local fixes like 21st century storm/sewer systems, seas walls, etc. As far as taxes when these events occur such as Sandy it is much more costly to all taxpayers to do nothing and pay for damage later. The cost of future storms to the country will be way more costly than to build and maintain a system to lesson the damage. I agree 100%. I was just playing devil’s advocate. I am still out of my home and want to avoid this in the future. Me too o I hear ya! I have bad news for all of you. I do not believe, nor have I ever, thought there was any way, no matter how much money was thrown at it, to prevent flooding and damage from the ocean. The fact is, that water action if the most powerful force on the planet. When the ocean wants to visit, it will vist, no matter what you do. Look at what happened to New Orleans during Katrina regardless of pumps, levees, and other flooding prevention measures. The only way to truly prevent property damage from being near the water, is to not be near it. Anytime you put houses near the water, this kind of stuff happens. Highlands has been flooding for hundreds of years, and thats just the way it is. Highlands already has a storm surge prevention mechanism, which is Sandy Hook. Other than that the only thing that can be done, are stronger and better bulkheads along the water. The one built along Marine place years ago, was much maligned and fought over. Yes, it is black and ugly, but it has done its job over several storms now. At the end of the day, what you will need is proper bulkheading of the town to start. Next, any structuers that let water into the interior of the town need to be fixed. This goes for storm drains or any other inlet. A major problem is the junk yard called Captains Cove marina which is a disaster and lets water right into the center of town. This needs to be properly bulkheaded, or just filled in. Once all of this is done, then if people want to talk expensive pump stations and the such, then that might help. In a situation like Highlands, its like pumping water out of a bath tub. But if the water is coming into the tub from all sides, no amount of pumping will help. Lifting the houses is an obvious way to present home damage, but does nothing to prevent flooding. Water will come in just as fast from the other marinas and beaches. What are you going to do, build the Berlin Wall at the entire water line? Access to the river and bay is vital for businesses in Highlands and people have been coming to Highlands for hundreds of years because of its access to the water. 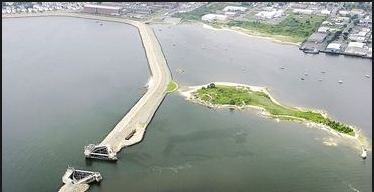 The surge barrier to Sandy Hook makes much better sense – its all shoals there already so construction would be easy. A storm barrier or bulkhead would definately work. The army corp has been trying for years to implement some kind of barrier, if a bulkhead of only 3 feet were to have been in place during irene there would have been minimal flooding if any. The former mayor and a sitting councilperson were against this project to the point they wouldnt even consider it.We need to move foward. We are now six months after sandy and there is no clear direction.Move foward and bend over backwards to help those who are sticking it out.